Surface editor-in-chief Spencer Bailey moderated the inaugural Adidas Originals #TLKS event with Ben Jones, Adwoa Aboah, and Pusha T.
On Thursday, Dec. 1, Surface editor-in-chief Spencer Bailey moderated the inaugural edition of Adidas Originals’s new talk series, #TLKS, during Miami Art Week. The event celebrated the brand’s EQT shoe, and brought together artist Ben Jones, model and activist Adwoa Aboah, and artist and G.O.O.D. Music president Pusha T for a panel discussion. Guests gathered at the Hilario Candela-designed Miami Marine Stadium, and enjoyed a special performance from Pusha T after the conversation. Pusha T agreed: “Anything that I’m doing has to be therapeutic in some way, shape, or form,” he said. 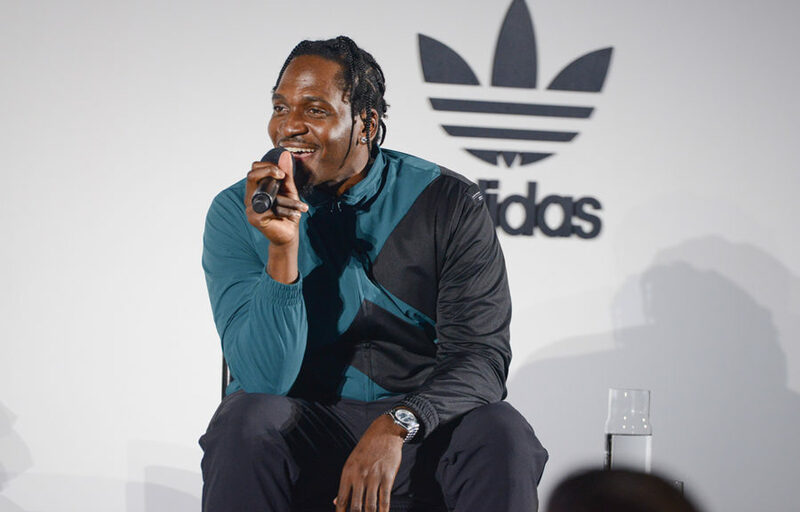 He also touched on how he chooses his collaborators, saying, “Half the battle of a collaboration is whether people see it as organic.” Pusha T discussed the way his medium transcends different disciplines. “Music is essential to getting anything done. I can’t just sit down and write without a beat,” he said.